How does one become the most fearsome bounty hunter in the galaxy? Well, you need a good work ethic, and stick with it because you won't get the good bounties right away. But the real trick is having the right look. 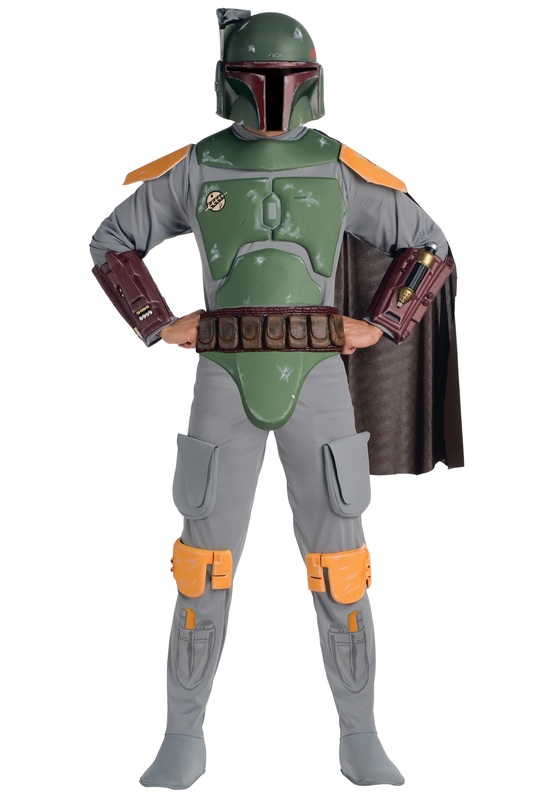 We can't help with the work ethic stuff, but this Deluxe Boba Fett Costume will get you started on the right track! Everybody in the Star Wars galaxy has heard of Boba Fett. Even if they don't know his name, they must recognize that menacing armor when they see him watching from the distance, and know that someone nearby is about to have a very bad day. But if you want to be like the Fett, you'll have to do more than wear his armor and be a crack shot with a blaster. He's notoriously clever, able to out-think even the slipperiest outlaws, and thanks to his discipline and patience, he could probably beat a Jedi Knight in a staring match! And while other mercenaries may use crude and explosive tactics to collect their bounty, Boba is clean and surgical, and may simply disintegrate his target rather than letting them get away. If you still think you have what it takes, then this is the licensed costume you're looking for! The jumpsuit is printed to look like the bounty hunter's uniform in the films, and features sewn-on foam armor plates and a half cape, for authenticity. It also includes a molded utility belt and a helmet to give you the look of a seasoned Mandalorian mercenary. All you'll need is a trusty blaster, and you'll be ready to see Jabba the Hutt about some entry level bounties! Trust us, you'll probably want to ease into it.